There was only one prize-winning teenager carrying stones big enough to say thanks, but no thanks to Roy Acuff. Only one son of Kentucky finding a light of inspiration from Bill Monroe and his Blue Grass Boys and catching a fire from Bob Marley and The Wailers. Only one progressive hippie allying with like-minded conspirators, rolling out the New Grass revolution, and then leaving the genre’s torch-bearing band behind as it reached its commercial peak. There is only one consensus pick of peers and predecessors, of the traditionalists, the rebels, and the next gen devotees. Music’s ultimate inside outsider. Or is it outside insider? 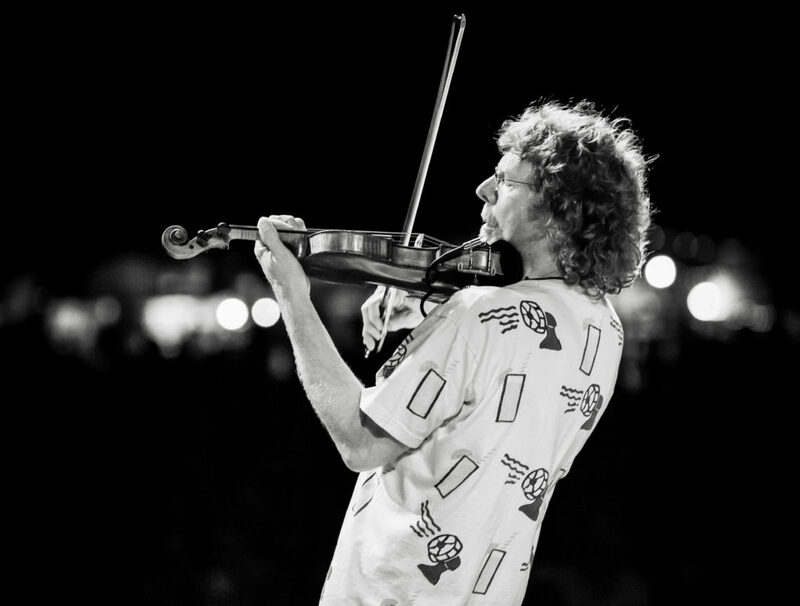 There is only one Sam Bush. On a Bowling Green, Kentucky cattle farm in the post-war 1950s, Bush grew up an only son, and with four sisters. His love of music came immediately, encouraged by his parents’ record collection and, particularly, by his father Charlie, a fiddler, who organized local jams. Charlie envisioned his son someday a staff fiddler at the Grand Ole Opry, but a clear day’s signal from Nashville brought to Bush’s television screen a tow-headed boy named Ricky Skaggs playing mandolin with Flatt and Scruggs, and an epiphany for Bush. At 11, he purchased his first mandolin. As a teen fiddler Bush was a three-time national champion in the junior division of the National Oldtime Fiddler’s Contest. He recorded an instrumental album, Poor Richard’s Almanac as a high school senior and in the spring of 1970 attended the Fiddlers Convention in Union Grove, NC. There he heard the New Deal String Band, taking notice of their rock-inspired brand of progressive bluegrass. Acuff offered him a spot in his band. Bush politely turned down the country titan. It was not the music he wanted to play. He admired the grace of Flatt & Scruggs, loved Bill Monroe- even saw him perform at the Ryman- but he’d discovered electrified alternatives to tradition in the Osborne Brothers and manifest destiny in The Dillards. See the photo of a fresh-faced Sam Bush in his shiny blue high school graduation gown, circa 1970. Tufts of blonde hair breaking free of the borders of his squared cap, Bush is smiling, flanked by his proud parents. The next day he was gone, bound for Los Angeles. He got as far as his nerve would take him- Las Vegas- then doubled back to Bowling Green. Bush played guitar in the group, then began playing after recruiting guitarist Tony Rice to the fold. Following a fallout with Peerce in 1971, Bush and his Alliance mates- Walker, Courtney Johnson, and Curtis Burch- formed the New Grass Revival, issuing the band’s debut, New Grass Revival. Walker left soon after, replaced temporarily by Butch Robins, with the quartet solidifying around the arrival of bassist John Cowan. Shunned by some traditionalists, New Grass Revival played bluegrass fests slotted in late-night sets for the “long-hairs and hippies.” Quickly becoming a favorite of rock audiences, they garnered the attention of Leon Russell, one of the era’s most popular artists. Russell hired New Grass as his supporting act on a massive tour in 1973 that put the band nightly in front of tens of thousands. At tour’s end, it was back to headlining six nights a week at an Indiana pizza joint. But, they were resilient, grinding it out on the road. And in 1975 the Revival first played Telluride, Colorado, forming a connection with the region and its fans that has prospered for 45 years. Bush was the newgrass commando, incorporating a variety of genres into the repertoire. He discovered a sibling similarity with the reggae rhythms of Marley and The Wailers, and, accordingly, developed an ear-turning original style of mandolin playing. The group issued five albums in their first seven years, and in 1979 became Russell’s backing band. By 1981, Johnson and Burch left the group, replaced by banjoist Bela Fleck and guitarist Pat Flynn. A three-record contract with Capitol Records and a conscious turn to the country market took the Revival to new commercial heights. Bush survived a life-threatening bout with cancer, and returned to the group that’d become more popular than ever. They released chart-climbing singles, made videos, earned Grammy nominations, and, at their zenith, called it quits. Bush worked the next five years with Emmylou Harris’ Nash Ramblers, then a stint with Lyle Lovett. He took home three-straight IBMA Mandolin Player of the Year awards, 1990-92, (and a fourth in 2007). In 1995 he reunited with Fleck, now a burgeoning superstar, and toured with the Flecktones, reigniting his penchant for improvisation. Then, finally, after a quarter-century of making music with New Grass Revival and collaborating with other bands, Sam Bush went solo.